Let's Welcome The New Sold.sg! Sold.sg has relaunched their new website after 1 whole year of sweat and blood! I love their new logo and the fact that it consists one of my favourite colour, ORANGE! 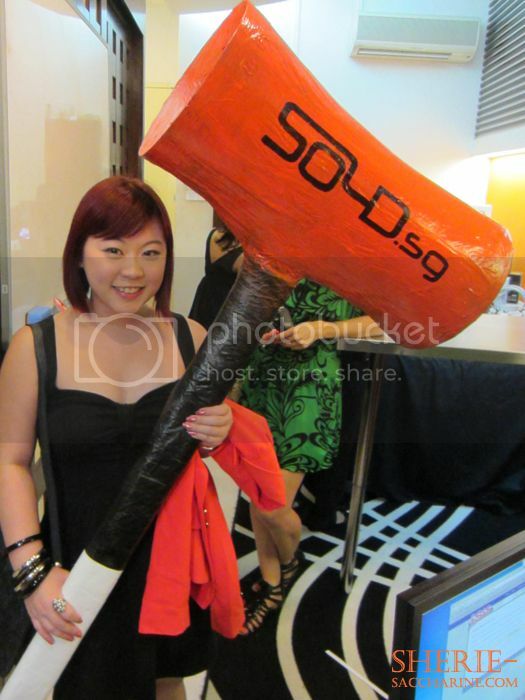 Before the relaunch, the SOLD.sg website only focuses on Auction with a Hammer as their logo. Refer to the following SOLD.my that is still using the old interface. In order to stay competitive and improve shoppers' experience, the new SOLD.sg has since included SOLD.sg SHOP and SOLD.sg SALE, not forgetting its SOLD.sg AUCTION section! I like how the new interface has a clean and sophisticated look and the iconic buttons (Auction, Shop, On Sale) make navigation a breeze! The photos are larger and of higher resolution which makes all products more appealing! I personally judge a website by the first impression. If the owner/s are not sincere to provide me with a smooth running platform, ease of navigation, clear product photos, they are OUT! 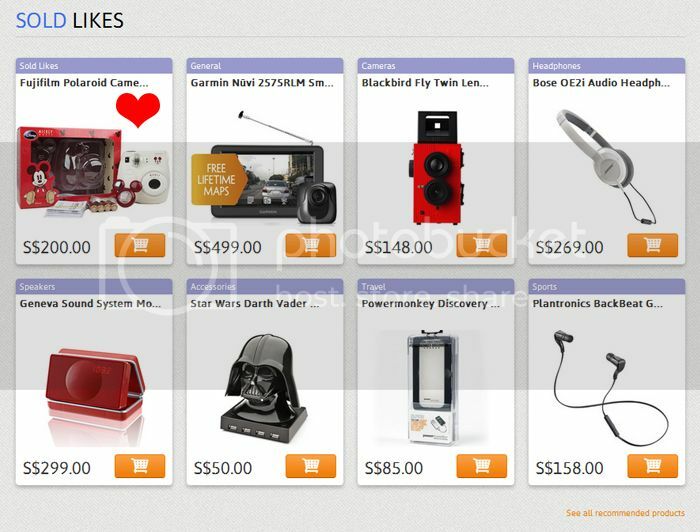 Let me take you through the SOLD.sg marketplace. The SHOP section features all the latest trending products that are unique and exclusive! Say YAY to being UNIQUE! 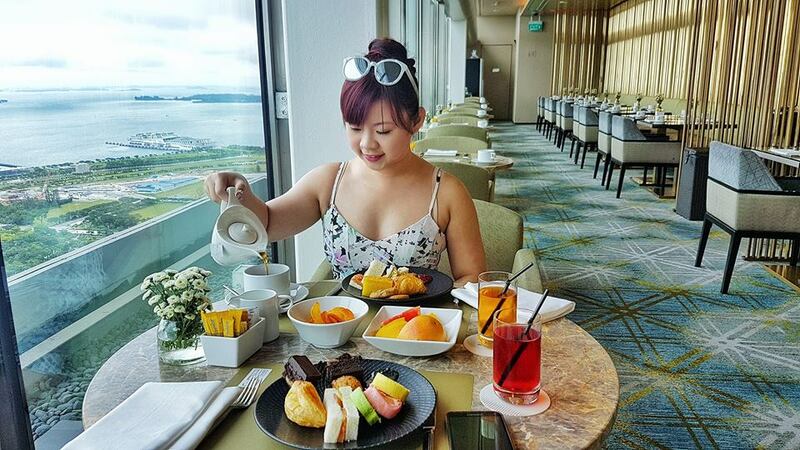 As mentioned by their co-founder, Angeline, the team at SOLD.sg aka Soldgers are always on a lookout for new and unique products locally and overseas, so that they can share their love to every shoppers! Everything you see on the website is their favourites! They have 100% confidence that they has the best sense and taste in products! 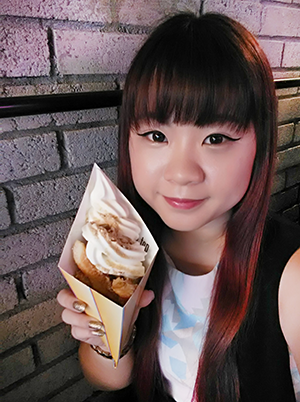 Where to get this cute thing in Singapore you tell me! How is it possible to get them at only $200 you tell me! Totally love their new interface user friendliness! Speak about personalization and engaging your customers! The lovely Soldgers will pump in their personal comments and put themselves in your shoes to let you know what's so BOOMZ about the products! All products are shot professionally to showcase the details and be assured that what you see is what you get! SOLD LIKES: Soldgers favourites, which also include the LTD ED! 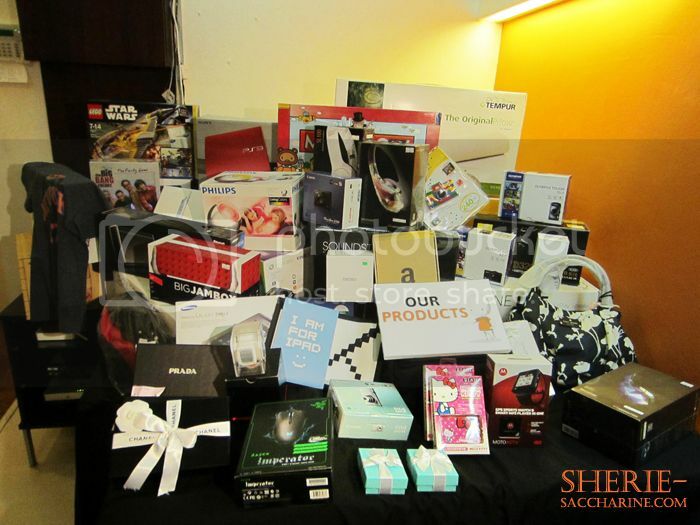 GIFT: Stuff that will surely surprise your loved ones on that special occasion! Best thing is.... They get shipped in just 2 working days after payment!!! No more long waiting time for that unique products that need to travel all the way to Singapore!! They are all ready in SOLD.sg office to be despatched to your home! The SALE section features products on SALE for a LIMITED TIME FRAME with LIMITED QUANTITY! 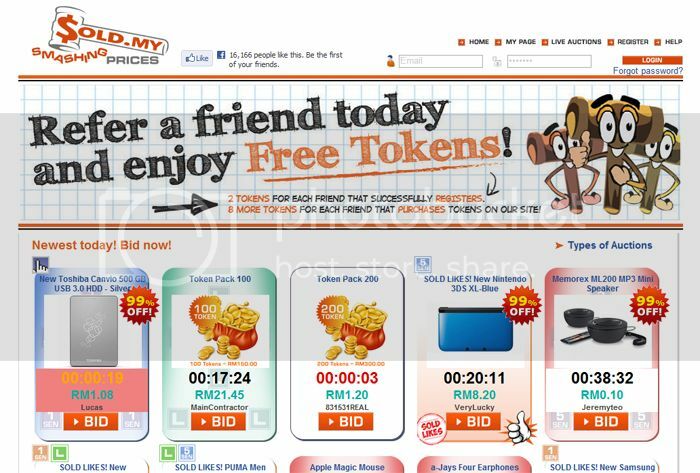 Say YAY to LOW PRICE! The sale will end when the products is either Out Of Stock or when the Time is up. (whichever 1st). As the products are very very popular and the prices are very very attractive, you have to make it yours within 15mins, if not, bid goodbye to what could have been yours! Alex and I have always wanted to get a game console, and..... WHAT?! SOLD OUT????!!!! 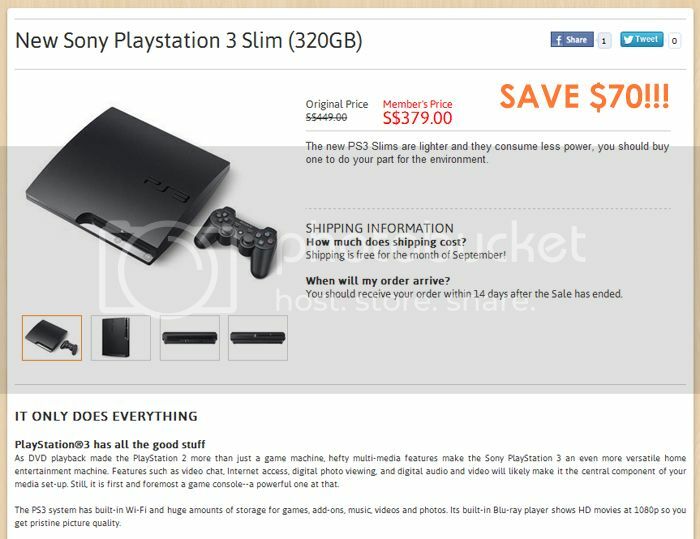 We could have owned the PS3 that "has all the good stuff" with a $70 savings!! Why we so slow? Don't cry over spilled milk like me and sign up for a SOLD.sg account, so you can see the price$ of the products on sale and get them FAST! Look! 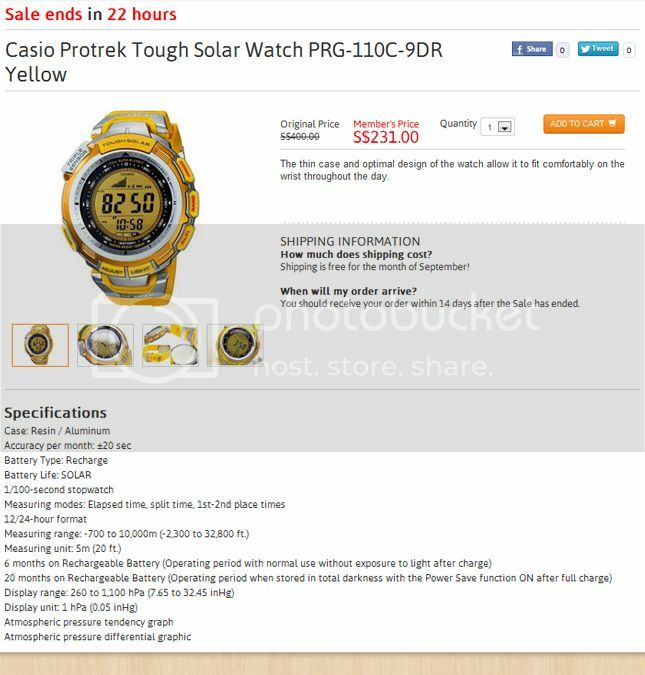 The Casio Proteck Tough Solar Watch is at a Whooping 42.25% discount!! Look at the Soldgers' sincerity to showcase the watch 360' and listing out all the specifications, so you don't have to Google them at the 11th hour! I sincerely apologise if this entry has converted you to an online shoppaholic. It's inevitable in this century! Last but not least, AUCTIONS! 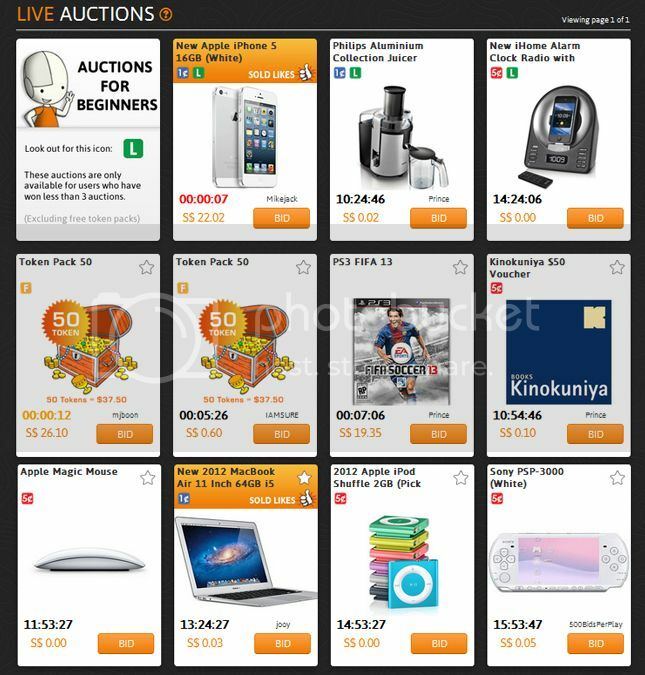 If you are new to Auctions like me, fret not! 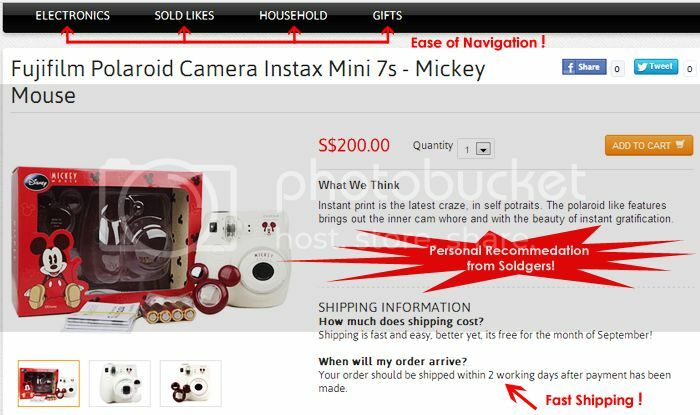 SOLD.sg has prepared a 3 steps beginners guide for all newbies! 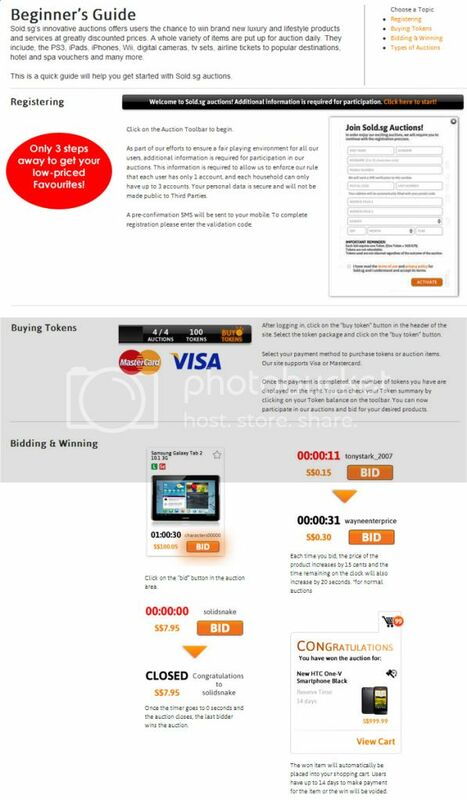 Each bidding tokens is only $0.75! Calculate the time and money you need to spend in order to get your latest gadgets at the retail shop. 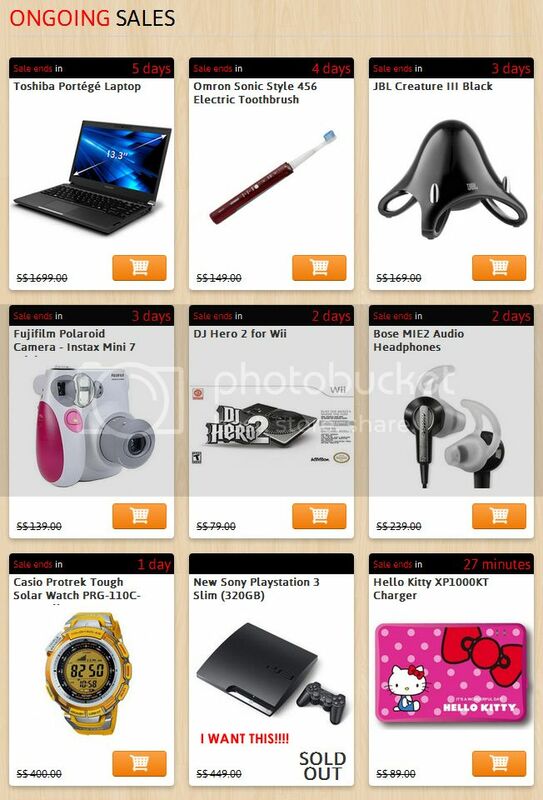 The fun and satisfaction of getting your gadgets at a low price in the comfort of your own home? Priceless. 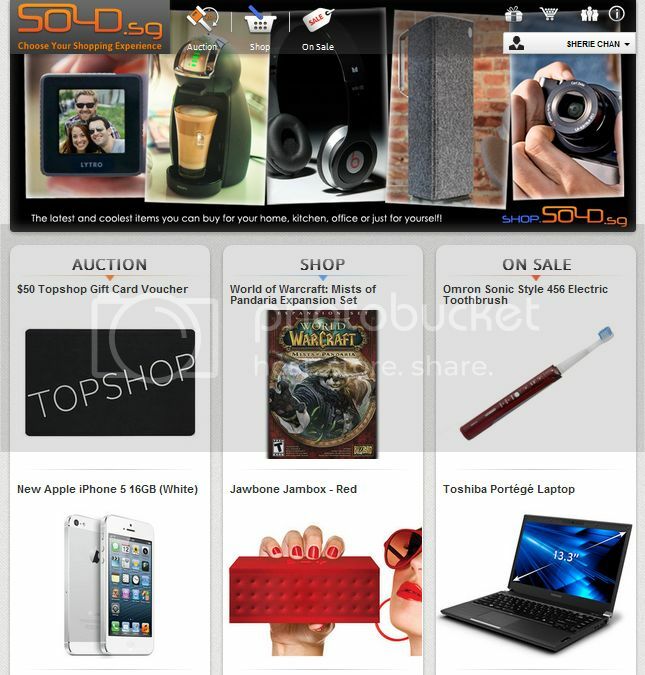 Okay, let's say you have a project to rush, and you are dying to bid for that Sony PSP-3000 that is on live auction. You got the money, but you got no time! How?! OMG!!! Almost everything we need and want is here, what more do we ask for? This is getting too addictive! Now, let me really rush off to finish my project before camping at SOLD.sg again! If you have not, do LIKE SOLD.sg on their Facebook, Follow them on Twitter and check out their Blog to get latest updates and find out what's trending now! My next entry will be on the SOLD.sg Relaunch Party! So lease stay tuned! PS: I seriously need a new compact camera for quality photos! A Sony RX100 Camera maybe?